The beloved National Lapoon's Vacation is getting the reboot treatment with the simply titled Vacation, which has the strange distinction of also being a sequel, and sees Ed Helms step into the shoes of Rusty Griswold as he takes a new generation of the accident prone clan on their own disaster filled trip to America's favorite family fun park, Walley World, before it closes forever. 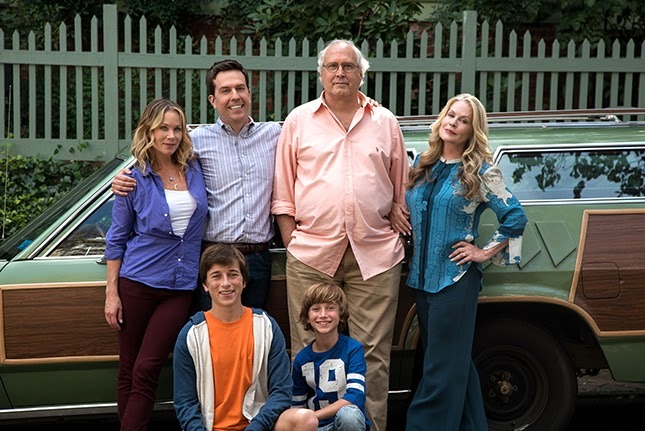 Warner Bros. have shared the first look at the continuing misadventures of the Griswolds, and it looks like Helms and Christina Applegate won't be the only Mr. and Mrs. Griswold, with Chevy Chase and Beverly D'Angelo also making an appearance (as does the iconic Wagon Queen Family Truckster Station Wagon). The Vacation movies is a franchise a lot of people grew up with, so it will be interesting to see if this new version will live up to expectations.